Paws Reports: #AtoZ Challenge : M is for …. 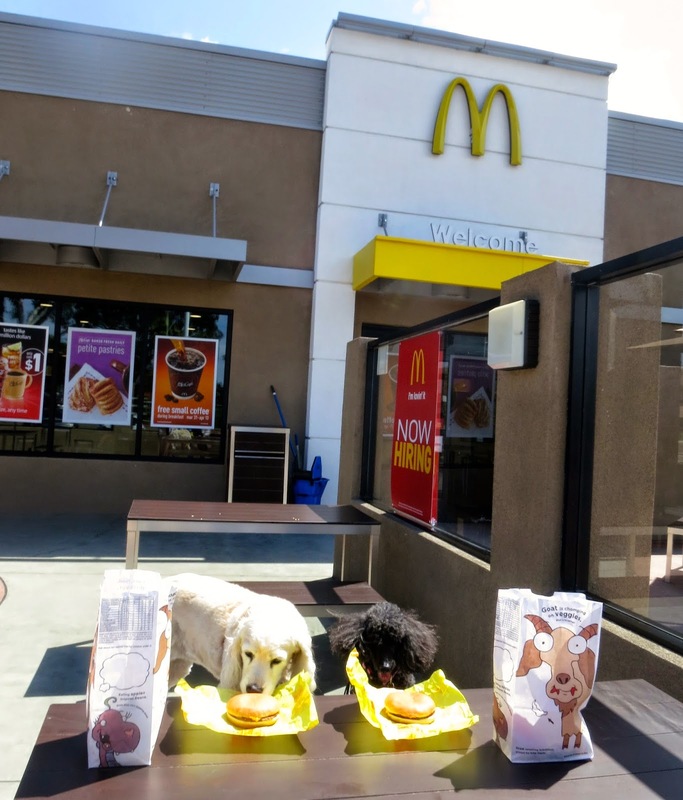 Continuing on with my blog challenge, we decided what M would be when we drove by the golden arches. Of course M is McDonald's. We each got a cheeseburger. Annie was a bit disappointed again though. She was hoping to stick with the M and get a Big Mac. I did give her some of my bread with cheese on it, I ate my burger. And Mommy was going to be the M until we saw the golden arches! BearHUG & RosyPoodleKisses! Yes ! Yummy! We love McD's too! BearHUG & RosyPoodleKisses! Rosy. I have to first say, I love your name, probably because it's my daughter's name. And we call my second daughter 'Ru'. Her name is Ruby. Must have been why I was drawn here. You have such fun A to Z posts. Our family went to legoland in Europe years and years and years ago. What fun. Love your McDonald's shot and your photos throughout your posts compel one to smile. Hope you are enjoying your seder celebration. Maria from "http://delightdirectedliving.blogspot.com/"
Thanks so much for visiting. So happy my blog made you smile -- that is the objective of my blog -- to create smiles ! PS - you have great naming taste! BearHUG & RosyPoodleKisses! We actually went through the drive through and then sat on the patio with our meals! Annie doesn't like fries! I had a few, before Mommy ate the rest! BearHUG & RosyPoodleKisses! Now that's a Happy Meal!